Description: You're a city planner that is working to build the bustling city of Sprawlopolis. As with any building job, you have to fall within certain parameters - and that's the basis of this game. Developed by the same team that put out Circle the Wagons and also published by Button Shy Games, this takes a lot of ideas from Circle the Wagons and makes it a cooperative game. At the beginning of the game, you take 3 random cards out of the deck and flip them to their scoring side. Add the numbers together on those cards and that is your scoring goal. Each of those cards has a rule that you need to follow in order to score points, and you'll use the rest of the deck (15 cards) to build a city. The scoring restrictions are related to the features (called zones) on the cards. 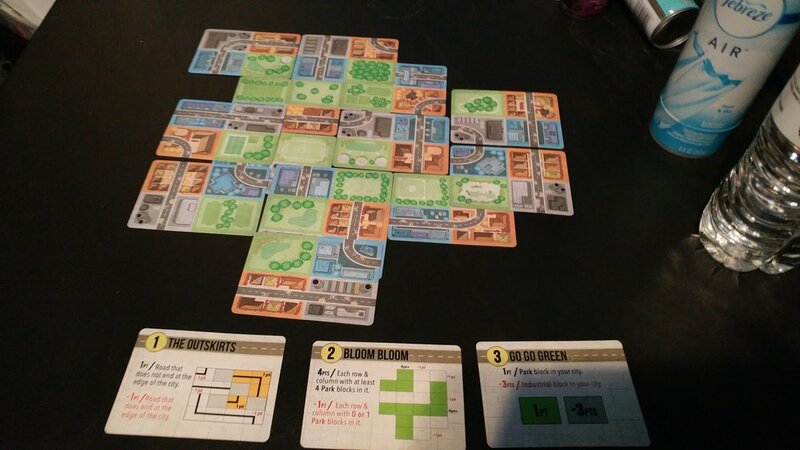 Each card has 4 areas - industrial (gray), commercial (blue), residential (orange), and parks (green). There are also roads going through every feature but the parks. Some of the scoring cards will tell you that you need to have certain features next to each other; others will tell you that you need to have certain features in certain areas, and so on. During the game, you are taking turns playing cards. The active player has 3 cards in hand, and after the active player plays a card, they pass whatever that they didn't use to the next active player and draws the top card from the stack. When you place cards, they can't be tucked under an existing card, you cannot put the card on its side, and you can't place it so that the card is only connected to the city by a corner. You get points for the largest block group of each zone type, 1 point per block. You get points based on the scoring restrictions from the beginning of the game (explained on each card). You get -1 point for each road. Easy scoring eliminates the negative points for roads, and hard scoring only scores the largest block group of one zone type. If you beat the scoring goal that you were given at the beginning of the game, you win! Review: You all know by now that I love city-building games and that I haven't been disappointed by one yet. So, when I got the opportunity to preview Sprawlopolis, I was all over it like white on rice, and I'm so glad that we did. First, the art is incredibly simple, but I feel like it needs to be. Too many details and it would look way too busy and detract from the game. I like the distinction of colors - I'm not color blind, but I sometimes struggle with colors that are too similar, and I didn't have an issue with this at all. Sprawlopolis is a game that makes you use all of your brain. All of it. The spatial reasoning, the ability to figure out what it is that you'll need to do in order to win, and all of it. It makes you think, and it makes you think in all of the best ways. Can I tell you something? The mathematics that went into this game blows my mind. To be able to figure out the intricacies of the scoring and how to determine the scoring goals must have taken a lot of playtesting and tweaking. The goals with the lower numbers are harder for you to complete, and the higher scoring goals are easier to do, but you can tell it took a lot of tweaking and mathing things out to figure it all out. And I cannot finish this review without telling the designers and publisher that you are amazing for being able to balance such a small game so well. Major props. My only complaint - and it's a minor one - is scoring the roads as negative points in normal mode. Unlike Carcassonne, there's no rule that says that roads have to connect. But, if you don't connect roads, the negative points could stack up at the end of the game, and counting them up can be a little fiddly. That's not as much as of a complaint as it is an "it's something that you'll get better at dealing with over time." They've taken that into account by allowing you to just ignore roads in easy mode, but I did want to make y'all aware of that. There is so much game in these 18 cards - not only is it easy to take with you anywhere, but it gives me what I want from city building games in a 15 to 20 minute game. If I don't have time to play Carcassonne (which, as many of you know, is my favorite game of all time), a quick game of Sprawloplis is going to scratch the same itch and I'm always satisfied after finishing a game of it. Yes, even if I lose miserably, like in this game (we scored exactly 1 point on Easy). As you can tell, I love this game, and Sarah loves it too. She likes it so much that she tried it solo one night when I had to hit the hay early. 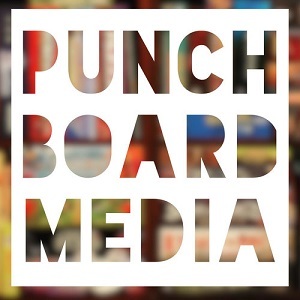 It is my favorite Button Shy game right now, and I know that it's going to keep hitting our table again and again. Try, Buy, Deny: 100% back it. If you like city building games, if you like cooperative games, heck, if you like games at all, this is very likely to catch your attention and keep it for the long haul. It's easy to learn, and as long as one of you understands the scoring at the end, you'll be ready to roll. The Kickstarter goes from May 15th to May 26th, and I will update the post with the link to the Kickstarter when it goes live. (Hey, guess what, here's the link) Check it out and see if Sprawlopolis is for you!